This script has been updated significantly, please make sure you’re using version 5. Notice, the capital SMTP vs. the lowercase smtp. There can be only one uppercase SMTP, and this represents the primary, or “reply to” address. While there are ways (example1, example2) to manipulate this output on the screen, I recently needed to create a complete list of all users possessing one or more secondary email address, and document what those addresses were. But we can see this doesn’t actually capture the correct users. In the above example, LiveUser1 only has a single proxy address, but it was returned anyway. This is because the result is actually converted to a number, and the “-gt” or “greater than” operation is done on this number; not what we want. I have written a script to help! This script creates a CSV output of everyone’s SMTP proxy addresses. Reports to the screen the total number of users found. Reports to the screen the user(s) with the most proxy addresses. Does not currently work with Exchange Online (planned enhancement). This uses “get-recipient” with no filters by default. You may want to replace this with something more restrictive, like “get-mailbox”, or use the -filter parameter. The guts of this script might help with this exact scenario, or really, anywhere you want to break out and evaluate multi-valued attributes. Feel free to use it and adjust as you see fit! b) CSV file: Output of everyone's SMTP proxy addresses. 1) Run this from &quot;regular&quot; PowerShell. 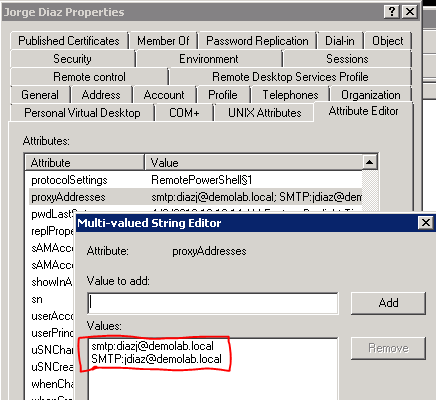 Exchange Management Shell may cause problems, especially in Exchange 2010, due to PSv2. The more the merrier. Thanks for reading! Here’s a one-liner that will get all SMTP addresses; 1st column is name and 2nd column is SMTP address. So each user will have one line per SMTP address. Cool, thanks! I wasn’t aware of the -expand switch. When I wrote this however, my requirement was to have each person on a single row, and only those with multiple SMTP addresses. Building on your ideas, this one will get you all SMTP addresses from all Recipient Objects and their DNs. Jaz, I’ve made the update. Please see above. I modified the script to get all the proxy addresses by changing the section building the placeholder object. Then in the output section I just remove the select. David, thanks! I’ve incorporated this into v4 above. Is there a way to filter via an ldap query so I can select specific OUs and attributes? Right now it gets all mailboxes, but you could modify line 26 so that get-mailbox uses the -filter switch. Is this what you mean? Hi, I’ve ran v4 of this script and it’s working fine. However I can see a few email addresses in the CSV file that I can’t see anywhere in EMC or AD…? Shouldn’t it be this instead ? I removed the “-replace “smtp:” part with just $_ since you have already taken care of that when storing smtp addresses in the variable $OtherAddresses. Hey, thanks for the comment John. You might be right, its been a while since I worked on this. FYI proxy addresses appear differently in EMC vs vanilla remote PowerShell, so it might have been related to that. it’s also possible i pieced stuff together and didn’t clean up!